This fitting was designed to meet the needs of the motion control industry where fast assembly, dis-assembly and re-assembly is important. No special tools needed for tube assembly, just insert the tubing until it bottoms. Composite Push-to-Connect is designed to be used without a tube support, providing full flow through the tubing. The grab ring design grips the tubing securely to provide retention. Composite Push-to-Connect external pipe threads come with a preapplied white PCTFE sealant. Positional external pipe threaded ends are featured on shapes for installion in compact areas and for precise positioning. -4ºF to +175ºF at up to 290 psi depending on tubing being used. Vacuum applications are dependent upon temperature and type of tubing being used. Tube sizes are determined by the number of sixteenths of an inch in the tube O.D. 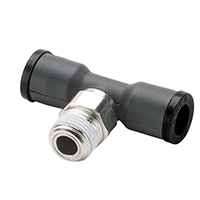 Composite Push-to-Connect fittings were designed as an economical alternative for pneumatic applications. Ready to use, compact,one-piece fitting for use with most thermoplastic tubing. Composite Push-to-Connect shaped fittings have a composite body with nickel plated brass componentry.